Welcome to Space Coast Chapter of AFP! 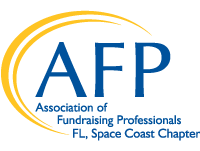 It is a privilege to serve this year as President of the Space Coast Chapter of the Association of Fundraising Professionals. As one of the founding members of our Chapter, I take great pride and I am honored to serve along side some amazing women - truly a remarkable cast of the best of the best development professionals who are deeply committed to the advancement of philanthropy by enabling people and organizations to practice ethical and effective fundraising. The core activities through which we fulfill this mission include education, training, mentoring, research, credentialing, and advocacy. Since 1960, with 230 chapters and as and international organization, the Association of Fundraising Professionals (AFP) has inspired global change and supported efforts that generated over $1 trillion. AFP's nearly 30,000 individual and organizational members raise over $100 billion annually, equivalent to one-third of all charitable giving in North America and millions more around the world. I encourage you to take a look at our website (afpnet.org) daily, as a member you will not only find job listings, but vast resources for professional development, and research on every aspect of philanthropy from ethics to planned giving. It is where you will find experts in the field of fundraising who mentor, cheer and support the profession and its vital workforce. I look forward to seeing you at one of our many events. Please do not hesitate to let us know what's important to you and how AFP Space Coast can serve you in your professional development. I hope you will be inspired to get involved!